When working with some applications we may need loop back interfaces. ( I needed for GNS3 ,on which I could connect my gns3 lab routers to external world (internet) or vmware /virtual box guests on my system. It is very easy to add a loop back interface on windows. But on macintosh it may appear difficult to get it work. I am quite familiar with mac os and I consider myself an advanced mac user ,but still it took 2 days for me to make gns3 work on macbook with all the features -not less than any of windows gns3 version. I will breifly write here how I did it. 1. Running GNS3 on mac osx with the tabbed connections terminal like how we use secure crt on windows ( see my post about tabbed connections with the combination of GNS3&secureCRT on windows). 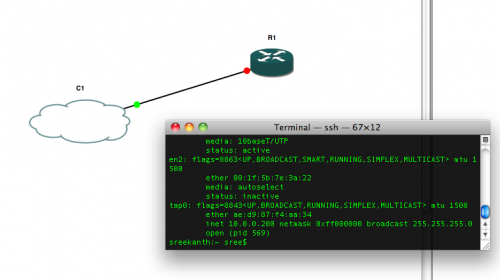 2.Connecting lab routers to internet or vmware/virtual box guests on mac osx..
1.On the first day ,I downloaded and installed gns3 ( which, gns3 developers say it is experimental package on mac osx) on macbook on which i was running mac osx 10.5.8 . After installation when i click on gns3 app It just stayed without any response. I searched gns3 forums and found many people are having same issue with mac osx 10.5 . Then i gave a try with mac osx 10.6 on my mac book and it worked well ,but only thing i needed to do was , changing the directory&configuration paths for net files which are copied from windows environment. 2.I downloaded and installed virtualbox 4.1.2 for my mac osx from here . 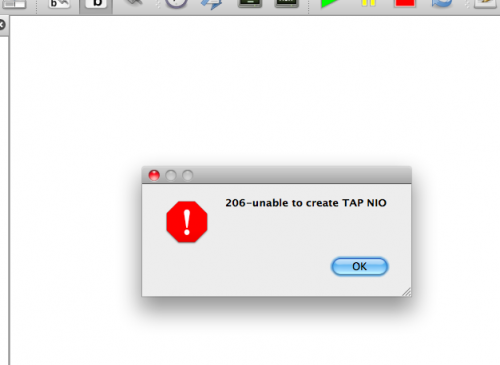 But this time GNS3 thrown an error message saying “206-unable to create TAP NIO“ . Finally I understood that 206-unable to create TAP NIO error is due to file permissions on /dev/tap and /dev/tun devices and I typed the commands which made my day . Below is My gns3 test router which connected to loop-back interface. 3.To run vce files , I downloaded and installed crossover for macosx which allows to run windows applications from mac desktop itself, means no need to run parallel or vmware to run windows applications. The problem is crossover is not free , If you can spare some time and take it as challenge then try wine which is free and many people say difficult to install ( Hope I will be writing how to install wine on Macintosh in my next post !). crossover ( free version is wine) is a kind of emulator , but run cross-platform applications( windows,macintosh,linux) natively without the need of having actual OS ( on vmware we should have installation disk to install os first). I created a bottle and installed internet explorer,visual cert exam suite on mac osx . 2011 Ask Admin . .